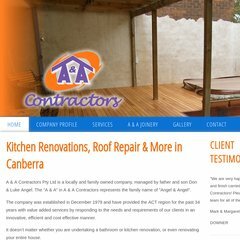 Topics: Services, A & A Joinery, Gallery, Roof Repairs & Maintenance, Insurance Repairs, & Extensions & Renovations. The site is programmed for PHP/5.4.36. It is hosted by Gohosting (Australian Capital Territory, Belconnen,) using nginx web server. PING (203.83.219.170) 56(84) bytes of data. A time of 218 ms, is recorded in a ping test.